This example uses a simple data set and a commonly applied model for dose-response relationships to examine how the parameter-effects curvature can be reduced. The statistics by which an estimator’s behavior is judged are Box’s bias (Box 1971) and Hougaard’s measure of skewness (Hougaard 1982, 1985). The NLIN procedure converges after 10 iterations and achieves a residual mean squared error of 15.1869 (Output 81.4.2). This value is not that important by itself, but it is worth noting since this model fit is compared to the fit with other parameterizations later on. The table of parameter estimates displays the estimates of the three model parameters, their approximate standard errors, 95% confidence limits, Hougaard’s skewness measure, Box’s bias, and percentage bias (Output 81.4.3). Parameters for which the skewness measure is less than 0.1 in absolute value and with percentage bias less than 1% exhibit very close-to-linear behavior, and skewness values less than 0.25 in absolute value indicate reasonably close-to-linear behavior (Ratkowsky 1990). According to these rules, the estimators and suffer from substantial curvature. The estimator is especially "far-from-linear." Inferences that involve and rely on the reported standard errors or confidence limits (or both) for this parameter might be questionable. The related global nonlinearity measures output table (Output 81.4.4) shows that both the maximum and RMS parameter-effects curvature are substantially larger than the critical curvature value recommended by Bates and Watts (1980). In contrast, the intrinsic curvatures of the model are less than the critical value. This implies that most of the nonlinearity can be removed by reparameterization. Partial results from this NLIN run are shown in Output 81.4.5. The analysis of variance tables in Output 81.4.2 and Output 81.4.5 are identical. Changing the parameterization of a model does not affect the model fit. It does, however, affect the interpretation of the parameters and the statistical properties (close-to-linear behavior) of the parameter estimators. The skewness and bias measures of the parameter LD50 is considerably reduced compared to those values for the parameter in the previous parameterization. Also, has been replaced by a parameter with a useful interpretation, the dose that yields a 50% reduction in mean response. 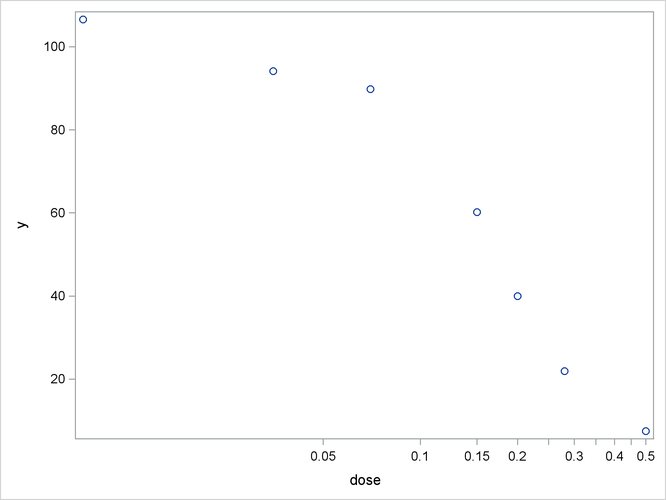 Also notice that the bias and skewness measures of and are not affected by the LD50 reparameterization. Note that the switch-off function continues to be written in terms of and the LD50. The only difference from the previous model is that is now expressed as a function of the parameter . Using expected-value parameterizations is a simple mechanism to lower the curvature in a model and to arrive at starting values. The starting value for can be gleaned from Output 81.4.1 at x = 0.3. Output 81.4.6 shows selected results from this NLIN run. The ANOVA table is again unaffected by the change in parameterization. The skewness for is significantly reduced in comparison to those of the parameter in the previous model (compare Output 81.4.6 and Output 81.4.5), while its bias remains on the same scale from Output 81.4.5 to Output 81.4.6. Also note the substantial reduction in the parameter-effects curvature values. As expected, the intrinsic curvature values remain intact.